Swindon based power three piece Iron Hearse have achieved a fair amount over the last few years whilst maintaining a pretty low profile and keeping their heads under the radar. This album first emerged on Gallipoli Records in 2006 but has been repackaged and boosted with bonus live tracks for release on Austria’s Psychedoomelic Records. On top of this, following a gig in Bristol with Against Nature, former Revelation man John Brenner will be releasing download tracks by the band on his Bland Hand label. There is even talk of a trip to the States, surely the holy grail for any British band. Iron Hearse class themselves as a doom band but they manage to distance themselves from the Sabbath aping hordes by peppering their sound with a classic rock/metal vibe that strongly evokes the vintage tones of Lunar Womb era Obsessed rather than the dirgey crawl of most of today’s doom crew. This whole disc is a veritable riff-fest par excellence, the guys know the value of keeping it simple and effective, throwing one crushing groove on top of another. Opening track “Rocktopus” slays from the off with one of the finest riffs known to man, Tony Iommi will be kicking himself for not thinking of this little beauty while “All Graves Empty” sounds positively upbeat. 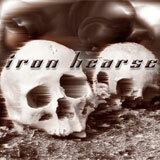 The quality stays high throughout as Iron Hearse show a belief in classic songwriting techniques, choruses flow like a fine wine topped of with Grant Powell’s throaty blues wail. The Obsessed comparisons don’t stop with the riffs, Grant’s vocals come across like a younger, slightly less pissed off Wino and his lead playing follows the same rapid fire jazz infused rain of notes as the great man himself. I get the impression the band didn’t have much time available to record this. There are some noticeable blips…the odd bum note but this somehow adds to the charm and gives a true impression of the band. Perfection is severely overrated and this disc shows a fine band in flight. That said the production is impressively thick with the guitars driving the sound forward like the front row of the England scrum. The live tracks, whilst not exactly essential, two of the four tracks appear elsewhere on the album, are of decent quality and show that the Hearse are a force to be reckoned with live…and having seen them a couple of times I can back that up. Swindon may not have much to offer. For the most part it’s just a place you pass on the M4 on the way from Bristol to London and its key contributions to the entertainment industry to date have been Melinda Messenger, quiffed up mockney Mark Lamar and quirky new wave popsters XTC but Iron Hearse show that it may just be worth a visit some time.